The ratio of youths who are neither in employment nor in education or training (NEET) in the youth population is called the youth 'NEET' rate. The NEET concept is associated with a wide range of vulnerabilities among youths, i.e. school dropout, unemployment, and weak response to labour market incentives. This NEET issue has gained enough merit in the Sustainable Development Goal (SDG) 8, where the target is to substantially reduce the proportion of youth NEET by 2020. The cross-country comparison of youth NEET is constrained by the availability of updated data. Most of the countries, especially the developing countries, don't have regular and updated Labour Force Surveys, which constricts the comparison of labour market indicators among these countries. However, using the data for 2011-2017 for 120 countries, we find that NEET rates are much higher in the Sub-Saharan African and South Asian countries compared to countries from other regions in the world. Among these 120 countries, the largest youth NEET rate of 52 per cent is from Trinidad and Tobago, and the lowest rate of 0.01 per cent is from Qatar. In Asia, among the 25 countries, the highest ratio of 44.77% is observed in Yemen, and the lowest ratio of 0.01 is observed in Qatar. Among the top ten Asian countries with high ratio of youth NEET, five are from South Asia. Pakistan has the highest ratio of 30.4 among the South Asian countries, whereas Sri Lanka, India, and Bangladesh have ratios of around 28. There is an important gender dimension in the youth NEET ratio too. Most of the 120 countries have much higher female youth NEET ratios than those of males'. In South Asia, the female youth NEET ratios of Bangladesh, India, Pakistan, and Sri Lanka are 44.5, 49.3, 53.6, and 37.3 respectively. Why is the youth NEET a concern? 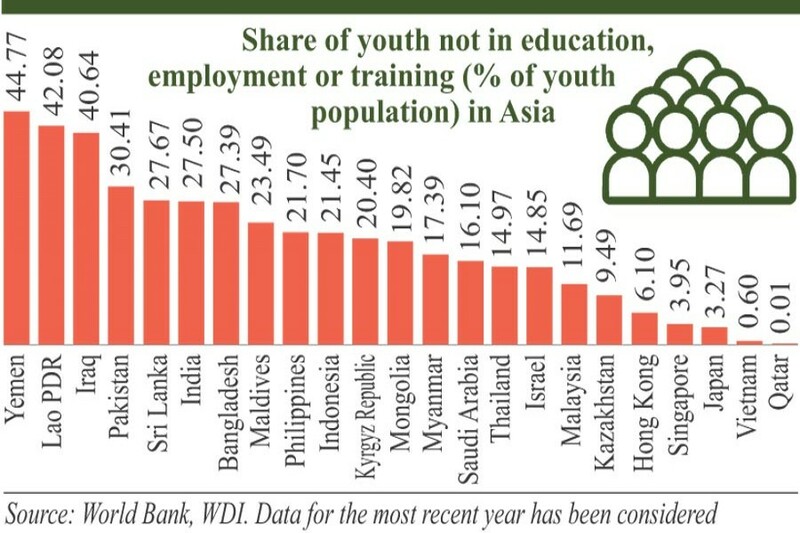 The high ratio of youth not in education, employment and training shows that a substantial portion of the youth population is not actively participating in the mainstream economy. Many of the developing countries, including those of South Asia, are passing through a 'transient' phase of demographic dividend which has the potential to exert a large positive effect on the economy stemming from a favourable age structure of the country. However, with a high level of youth NEET, much of the prospect for realisation of such demographic dividend remains at stake. As many of these countries eye to meet the stiff targets of the SDGs by 2030, these countries also face a number of challenges related to slow progress in structural transformation, lack of economic diversification, high degree of informality in the labour market, slow pace of job creation, poor status of social and physical infrastructure, and slow reduction in poverty and rising inequality. The high ratio of youth NEET further exacerbates these challenges. Evidence also suggests that both the South Asian and Sub-Saharan African countries face the high level of youth employment challenges in terms of vulnerable employment shares, i.e. self-employment, unpaid work, and informal employment. Even in wage employment, jobs can be low-productive, and low-paid. For many developing countries, especially for South Asian countries, low female labour force participation and the high degree of gender segregation in the labour market are common features. There is also a high concentration of females in vulnerable employment. Though structural transformation of the economy for large-scale industrialisation remains a major policy objective in many of these countries, the challenge of realising labour-inclusive structural change through the large-scale employment of low- and medium-skilled labour is enormous. To address youth employment challenges, especially the NEET issue, there is a need to undertake a cohesive approach involving the government and the private sector. The employment policies for youths should focus on ensuring decent work, raising productivity and earnings, occupational and health safety, and job security for all. The development and employment policies need to be pragmatic that can integrate the education sector and the labour market. The policies for job creation should be at the top of the agenda. This will require actions from governments in the form of widening the scopes and coverage of relevant training programmes, supporting the sectors with high potentials for youth job creation by removing the binding constraints these sectors face, and supportive fiscal and monetary policies for the promotion of youth entrepreneurship. To make the training programmes effective, skills training needs to be linked to the requirement of the industries. Also, training programmes need to be customised and tailored to meet the interests of different target groups which can result in better outcomes. There should also be targeted programmes for the specific disadvantaged segments of the youth population (i.e. female youth or youth from lagging regions of the country) through skill-development and appropriate labour-market policies, which include customised training and work experience programmes, job search assistance and other employment services. Furthermore, there is a need for building public-private partnerships, in collaboration with international organisations, for investments to improve the working conditions aiming to promote decent jobs for youths. Dr. Selim Raihan is Professor, Department of Economics, University of Dhaka, Bangladesh, and Executive Director, South Asian Network on Economic Modeling (SANEM).